"Discover why this children's book author was commissioned an admiral in the Texas Navy by the Governor of Texas"
My name is Mark Mitchell and I live in land-locked Austin, Texas. I tend to get seasick on the water. I can’t tie a sheepshank knot to save my life. 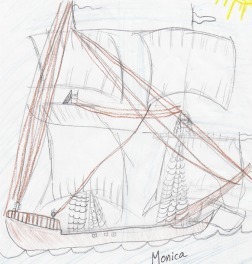 But I wrote and illustrated a book about a historic sunken ship that archeologists recovered from a Texas bay. The book, Raising La Belle won two national literary awards and resulted in my Texas admiral's commission. You'll enjoy knowing about my Raising La Belle school presentation that gives every student a "front row seat" at the archeological excavation that made headlines around the world. Download Raising La Belle for free! You will receive an e-mail with a link to the free download. You are under no obligation for anything. Your name and e-mail address will not be shared with anyone. * And fourth and sixth graders writing comments like, "..it was exquisite." and "The best thing I liked about your presentation was all the info I was getting. It was so much my head could explode!" And receive your free download of the award-winning book Raising La Belle right away!